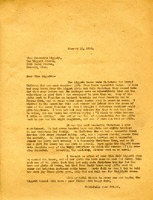 This is a letter describing that there is $1,000 dollars enclosed for the Berry Schools from Robert F. Mattox. 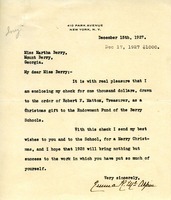 It is a Christmas gift to the Berry Schools. 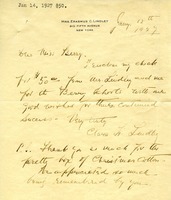 Clara H. Lindley sends Martha Berry a check for $50 and thanks her for her Christmas present of a box of cotton. 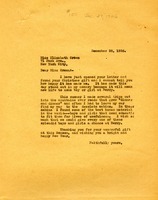 Martha Berry tells Griswold that she got her letter about the Froebel League sending Christmas toys to the mountain children at Berry and that she would gratefully accept them. 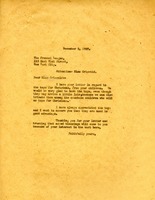 Thank you note for the little Christmas gift. 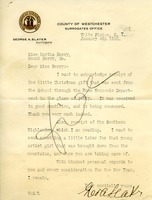 Martha Berry writes to Elizabeth Green, thanking her for her Christmas gift, saying that the day will stand out in her memory because it means a chance for some poor boy or girl. 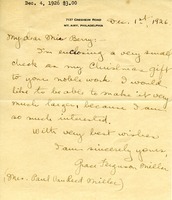 Grace writes to Martha with a check as a Christmas gift for Martha's noble work. 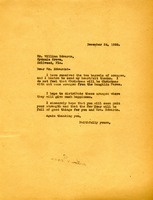 Miss Berry regrets that their Christmas gift to Mrs. Edwards did not make it to her in good condition. 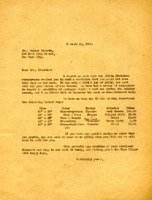 She offers to have a rug made for her and sends her a list of the available rugs. 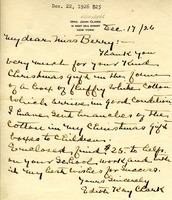 In this letter Elizabeth Clark thanks Martha Berry for the Christmas gift of cotton and encloses twenty five dollars for the school.